The Smoky Mountains are ridiculously amazing! And if you haven’t hit them up yet, you might as well do it this year. I think Knoxville resembles the diversity you find in the mountains in lots of ways. There’s something for everyone, but you have to be willing to get out of your car. If you wanted you could pin up a map of the park to the wall, literally throw a dart and hit a trail, stream or feature worthy of a full day’s adventure. And since there are no entrance fees, you could do it on a tight budget of a half-a-tank of gas. We heard about a small creek trail near Cosby that folks travel from all over to see and hit it up in late March. The only bad thing about our trip was the drive, which happened to take us through Pigeon Forge. But once we passed through and headed north from Gatlinburg, things start to look, well, a little more country. Off 321 we turn north to enter the park at Greenbrier. The trailhead for Potter’s Creek Trail was at the end of the Greenbrier road and we actually had trouble finding a parking spot. This seems a little odd because the park is known by the number of visitors who actually never get out of their car. They just drive around the place without ever setting foot on a trail. I mean, c’mon! At only a few minute into the trail we hit wildflowers, lots of little irises, trilliums and purple and white flowers. We continued our saunter almost to the next trail junction, but decided to cut the hike short for our next leg of the trip- Hot Springs! My wife will probably kill me if she finds out I’ve fibbed our secret Knoxville getaway. From Greenbriar, we headed north for about 45 minutes to Hot Springs, NC, a mecca for AT through hikers, whitewater bums, and Knoxville bo-bos like us. From Knoxville, the trip is only about an hour. Ever since we moved to Knoxville we’ve been going to HS, usually on Sundays, and always to take a warm bath in the naturally hot waters at the spa. For $25 ($30 after 6 o’clock) you can rent a tub for two for an hour right on the French Broad River. For the most part, they are a series of hot tubs with jets with privacy fencing around them. Supposedly tub #8 is the hottest, since it is closest to the water source. What better way to relax after a long hike than to take a long soak! After the springs we stopped in a new restaurant in Hot Springs called the Iron Horse Station. To our surprise the place was really nice for a small town, and the burgers are really good. I was craving a ceasar salad for a side and they were out of lettuce, which I guess happens when you have to pack in food for an isolated place like that. So we opted for French fries and steamed veggies, which had to have been the only place that actually serves really good steamed veggies with a burger. Not the frozen carrots and broccoli here, we got asparagus and eggplant and zucchini! The meal was complimented by the intermittent dialogue between the bartender and the town bum, who kept trying to sneak 40s of bud ice into the bar in his back pockets. Next door looked like a coffee shop in the daytime, and around the restaurant seemed like overnight rooms for guests. I imagine this new spot would be the perfect layover for throughikers, but for dayhikers, it’s a nice ending to a perfect daytrip from Knoxville. 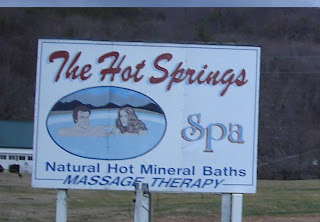 Hot Springs is my getaway too! I think I am going there this weekend. It's so great. I love the Paddler's Pub. Thanks for featuring HS, LO! Remove the post! some things should be kept secret! Whoa! Lo actually posted. Haven't seen that in months. I'm also digging this post your secret getaways in the smokies trend. Perfect for summer. it's porter's creek trail, not potter's creek trail. Is the Bridge Street Cafe still open? Seems like I had heard that it closed down. As a last minute decision, I decided that HS is the place I want to visit this weekend. Thank you for the helpful information!